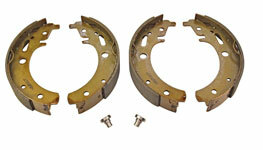 The brake shoe rear set consist of an metal basic part and an lining. Complete set inclusive 4 brake shoes: 2 x with long lining and 2 x with short lining inclusive mounted lever for the hand brake cable. Fit to Trabant 601 and Trabant 1,1. Also fit to some trailers and campers like Qek and Camptourist / Klappfix with hydraulic brake system. Complete in Germany reclaimed brake shoe set for the rear brake. Brake shoe complete with lining, fit to the Trabant 601 models Limousine, station wagon and Kübel, Qeck, Camptourist / Klappfix. Exchenge part: You have to ship one set of original brake shoes to our company in advance ! Low budget brake shoe kit consist of an metal basic part and an lining. Complete set inclusive 4 brake shoes: 2 x with long lining and 2 x with short lining, 2x rivet for mounting lever for the hand brake cable. This kit is made by ATE. 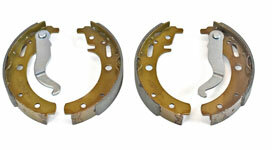 Complete set inclusive 4 brake shoes: 2 x with long lining and 2 x with short lining and 2x rivet. Lever for the hand brake cable are NOT included. It have to be installed you old ones. Rivet bolt for mounting the hand brake lever at the rear brake shoe (short lining). Fit to Tarabant 601 and Trabant 1,1 rear axle, Wartburg 311,312,353,1.3 and Anhänger wie Qek, Intercamp, Oase, Camptorist, Klappfix. The pressure web is fixed between the two rear wheel brake shoes to transmit the power of the mechanical handbrake to both of the brake shoes. Rear brake sliding element Trabant 601. * All prices inclusive VAT and plus shipping costs.